Heat a large skillet over medium to high heat and drizzle with 2 tablespoons of olive oil. Add garlic and sautee for 1 minute. Add the sun-dried tomatoes and sautee for another minute. Add the zucchini, sea salt and pepper to taste and cook for 5 minutes. Turn the off heat and add the fresh basil. In a medium bowl mix the eggs, the quinoa and the zucchini mixture. Deglaze the pan you used for the zucchini with 1/4 cup of water, scraping any brown bits from the bottom with a wooden spoon. 1) cook the frittata over medium heat for about 20 minutes, turning the frittata upside-down halfway through with the aid of a lid. 2) Heat the oven to 400°F (200°C). Cover the skillet with foil and bake for 20 to 25 minutes. 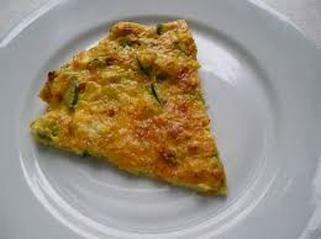 You want the eggs to cook but not to bake all the moist out of your frittata. You can serve it warm or at room temperature.